Around this time every year I like to make a pumpkin cake for my son's birthday. This has become a tradition in our home. The cake you see here was made by myself, my daughter in law and my daughter. Today I had to make my son's birthday cake on my own. I used the same technique as the above cake with just a little difference in the final touches. First pour the cake batter into two stainless steal bowls (Pyrex glass bowls can be used) of the same size. Once the cakes cool stack them together. Using icing between them to secure the cakes together. Now apply a thin crumb layer of icing over the cake. At this point I laid foil (wax paper would also work) on the cake stand up against the bottom edge of the cake to catch the drips from the icing. This makes it easier to clean up the cake stand after icing. The following step is my technique for getting smooth icing on a round cake. If you are using canned or homemade icing you will need to heat the icing in the microwave for a few seconds. You can also heat the icing on the stove in a double boiler. I heat it only to pouring consistency. Using a measuring cup pour the icing over the cake. Once you have finished covering the cake you can spoon icing onto the lower half of the cake. This is where I changed my cake up this year. I used my cake spatula and pulled the icing up over the cake in single strokes. It made a textured pattern some what like a pumpkin. Making the stem is very simple. I used a chunk of cake and spooned warm icing over the piece. Then lifted it onto the cake with a spatula. This is my favorit part of making the cake. 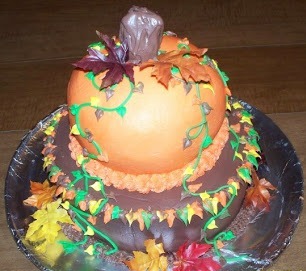 Decorate the cake with fall leaves. Using a piping tip and leaf tip decorate your cake with vines and leaves. Or just use fall leaves from a craft store. Both cakes were easy and fun to make. It is nice to be able to make a cake with out buying a special pan. I have also made this same cake using a bunt cake pan. I did not like the results as much as I do using a mixing bowl. Do you have a cake decorating technique you would like to share? I would love to share your ideas with my readers. Wow, that is awesome!! You have quite the talent! I do not have the cake decorating gene in me. haha, but it's great reading up on yours! Oh my, this is beautiful. Not to mention, I'm sure yummy! I like the idea of pouring on the icing. My icing is never pretty. Keeps me from making cakes! Oh I love this idea! How cute! You do such a great job on your cakes. I love how this one turned out. Thanks so much for letting us know how you do it. Wow Bonnie... That is AWESOME.... I could NEVER EVER attempt something like that. It looks so professional. You all should go into business.. You could make a bunch of money on cakes like that. That was beautiful and it is hard to believe - and I know you did - but it is hard to believe it was nor professionally done - hey are you a professional? Beautiful. Oh both of these cakes look amazing! I bet your son really looks forward each year to getting such a special cake! Oh that is awesome it is so nice you shared this wonderful secret to this beautiful cake. It is something I would love to try but I am sure I can never do such a great job. What a beautiful cake. Looks yummy too! It turned out so wonderfully -- I thought for sure you had purchased it. Oh my gosh, how cute. I love making cakes but I just can't get the icing right. I end up buying mine lol. I need to experiment more with cakes and icing and I will have more time for that after the first of the year. I should make that my New Years resolution, except I never keep them, so maybe it should just be a NY goal :).